Oh, BABY! — Ends in Style. Yes, we are still here. I must apologize for the absence of posts lately. We've had a whirlwind of events (including Christina visiting gorgeous Iceland!!! We'll have that post for you soon), but that's no excuse for neglecting our baby, Ends In Style. SPEAKING of babies (how was that segue?!). 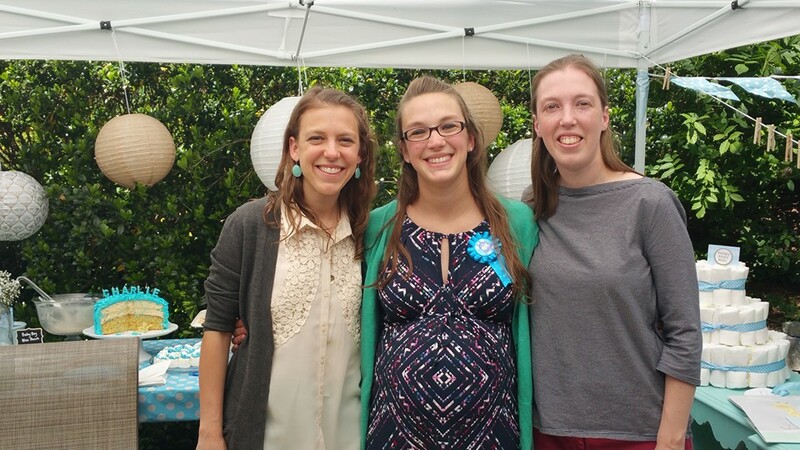 I, along with my co-host, Amanda, threw a baby shower for my sweet friend Suzanne last weekend just before her first Mother's Day. She is such a dear friend! We grew up right around the corner from each other, played on the same volleyball team in high school, and were just acquaintances until we bumped into each other in college and decided to be roommates. Now I cannot imagine life without Suzanne in it. She's the kind of friend everyone needs. Caring, sweet, genuine, funny, and full of life! It was an absolute joy to host a shower for her! Baby Charlie is already so loved! We showered Suzanne and Charlie with gifts and also with lots of yummy snacks, because no party is complete without snacks. My sister always says that if you've had children, you love lemon desserts. She has to be right even if you haven't yet had your child because when I asked Suzanne what kind of cake I should make, lemon was a top choice. I made a 4-layer "Luscious Lemon Cake" with lemon curd filling and cream cheese frosting. Here's a recipe for a similar cake and filling via Southern Living. My recipe is from a very old Better Homes and Gardens cookbook (couldn't find it online) and I frosted it with a simple dyed-blue cream cheese frosting in a star-tipped piping bag. Topped with cute letter candles from Target's party department, it was really a cute cake! I love Target! Great prices and really good selection of stylish party decor. I made coffee punch, which is an absolute must if you're having a party for a coffee lover. It's about 50% ice cream, 50% coffee. Here's a great recipe if you'd like to try it! Stir together coffee, milk, and vanilla. Float half of the ice cream on top until it melts in. Just before serving, float the other half of the ice cream on top and enjoy! We also enjoyed some Baby Boy Blue punch made from Hawaiian Punch, Pineapple Juice, and Lemon/Lime Soda. It was blue sugary heaven! Keeping all of the snacks pretty simple and keeping the decorations cute and easy makes for a more fun party for the host, guests, and most importantly, the mother-to-be! If you're not sweating and worrying about too many little details and how many dishes you'll have to do after the party, you'll definitely have a better time and be a better hostess. After snacking and talking, we took the time to play some games. One gross one not-so-gross. I'll spare you images from the dirty diaper game! We melted various candy bars in diapers and had party guests guess which candy bars were in them. The winner got a little gift bag and the pride of knowing which candy bar looked the most identifiable when looking mostly like poop! The second game we played didn't turn any stomachs. We guessed the size of Suzanne's pregnant tummy and the closest guess won a prize! Suzanne was a great sport! Adding little cute touches of decorations (like this polka dot table cloth, the pennant banner and chalkboard food markers, and the baby bootie mixed nut cups) adds a touch of whimsy to the party. And who doesn't love a little whimsy ;) By the way, if you're interested in making the baby booties, here's a good tutorial. We made ours with little ketchup cups, tissues, cotton balls, and ribbon. And no baby shower is complete without a diaper cake! I made one by just tightly tying rolled up diapers together in a 3 layer cake shape without any glue or cardboard, but if you like instructions, which most sane people do, here's a tutorial for making a diaper cake! To thank everyone for coming, we made little bags of popcorn as favors with gold and silver rimmed tags we labeled "Ready to POP!". Cute, right? We hope you had a great Mother's Day and feel inspired to take on throwing a shower sometime! Keep each thing sweet and simple and don't worry too much about all of the little details--it's about enjoying the moment with your loved ones.